Ahhhh Disney Sea. A Disney goers paradise. I grew up in California, and was fortunate enough to be able to visit Disney Land quite a few times as a child as well as participating in yearly events like Music in the Parks for concert band. Disney has always been part of my childhood as it is for most people growing up in the 80s and 90s. I didn't even realize that Japan had a Disney park until I came to Japan back in 2011 and boy oh boy was I amazed at the magical newness and perfection of Disney Sea. I could go on forever about how beautiful the park is and so on but today's article isn't about that. Today's article is about food. We all like food, especially food that's cute right? 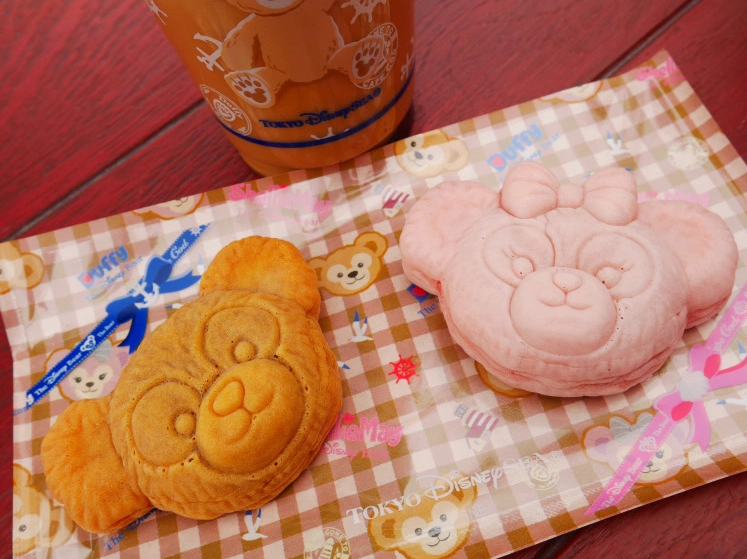 Today I'll be sharing my top two favorite things to eat at Tokyo Disney Sea. Did I buy this phone case to match the mochi? You may never know. 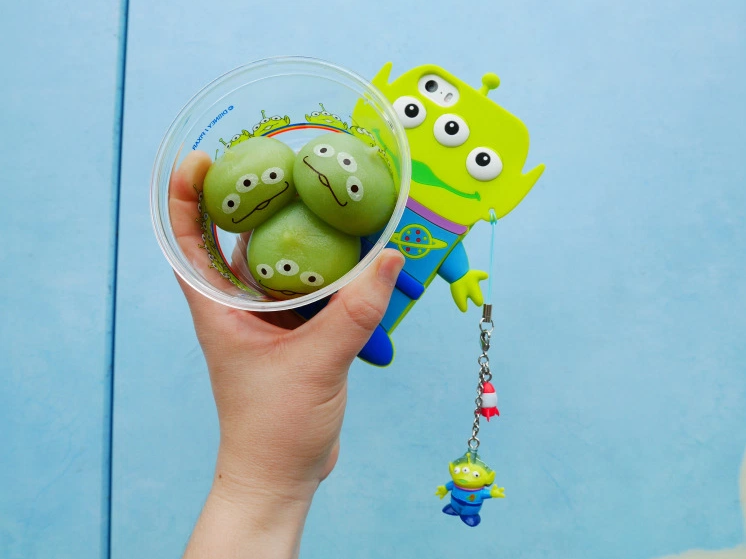 The alien mochi are probably one of my most favorite sweets at Disney Sea because they are reasonably priced at 360 yen (around 3 dollars), crazy adorable, and have three separate flavors (chocolate, strawberry, and vanilla mouse). They can be found at a cart near the Toy Story Mania ride in between American Waterfront and Mediterranean Harbor. You can also find them at Mamma Biscotti’s Bakery. The mochi cart is usually near the entrance of Toy Store area but not 100% of the time! I sadly stumbled upon this issue the second time I went to Disney Sea and had to ask around as to where I could find them. As for how they taste, well, the alien mochi are just so adorable it's hard to eat them at first. Once you sink your mouth into them it's hard not to want another helping. The last time my friends and I went to Disney Sea we had two helpings of them and almost went again for a third time. They taste amazing and really give you a true taste of Japan with the soft mochi outer layer. 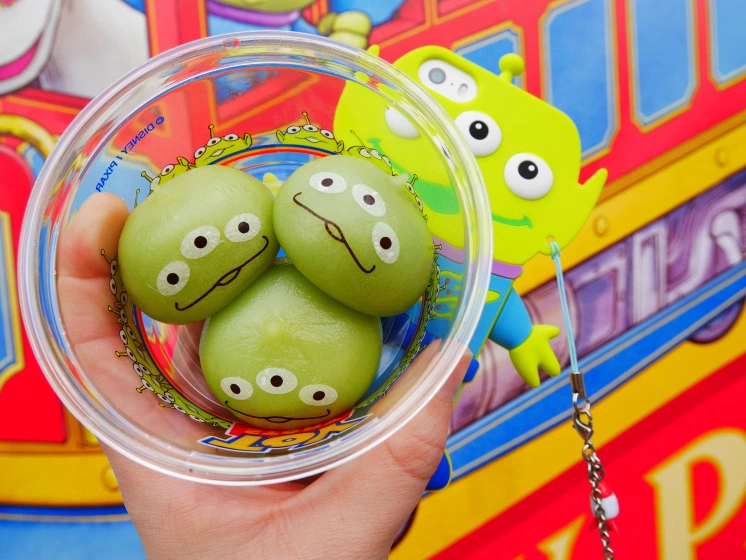 The cute presentation brings them to another level making them an absolute must eat at Disney Sea. You have to try these. And then eat them again on your way out! As you can see I'm on a mochi roll. Mochi is just so uniquely Japan it's almost a crime not to try these while you're here. You can find Duffy and Shellie May mochi around American Water Front at Cape Cod Confections. Shellie May is filled with blueberry cream filling and has a bit of a different texture compared to the alien mochi. As for Duffy, he had straight up chocolate pudding inside of him or at least that's what it tasted like. I guess I'm not surprised though, if I were to imagine Duffy having some sort of edible filling, it would be chocolate pudding haha. The outer layer of mochi on these is a bit thicker than the aliens and the filling is much more dense. I found these to be sweeter than the mochi above. If you have a sweet tooth, Cape Cod Confections may be right up your alley. Also you can purchase some awesome seasonal goods as well. While my friend and I tried these, we also picked up a raspberry milk tea from the same stall. Duffy and Shellie May just scream Japan to me. The first time I lived in Japan I always saw young school girls wearing Duffy and Shellie May pass holders and was always stricken by how cute relaxing the characters were. 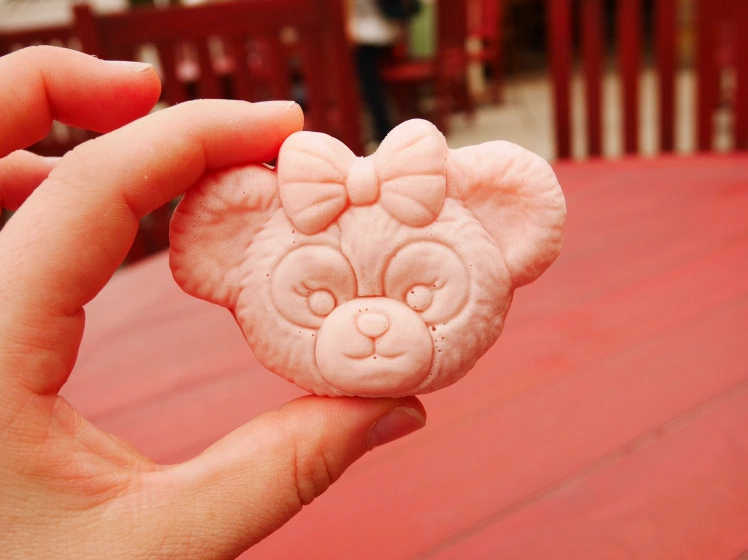 Never did I image I could actually eat Duffy or Shellie May's face so this is why it's made number two in the top things you must eat at Disney Sea. ***This article was written by Johanna Forsberg and Lynnie Lim in collaboration***One of the things that Japan does really well is tabehoudai – all-you-can-eat!